7 November 2014, at 9:36a.m. GERMANY - Big Dutchman has been awarded a Gold Medal for its revolutionary PEF process for liquid feed, which involves high-voltage pulses making entire maize plant digestible for pigs. The German Nutrition Society (Deutsche Gesellschaft für Ernährung, DGE) states that food rich in crude fibre is indispensable for personal health and well-being. This not only applies to humans, but to pigs as well. An entirely new process now makes the important roughage in the fibre of the full maize plant digestible for pigs. Feeding maize can reduce costs and improve the land use as well as animal health. The innovation was awarded a gold medal by an international expert commission of the DLG (German Agricultural Society) prior to EuroTier 2014. Big Dutchman, the German market leader for livestock technology, has further developed PEF processing for daily use in pig houses. Scientific support was provided by the German Institute of Food Technologies (DIL) in Quakenbrück. The Big Dutchman PEF system applies high-voltage electric pulses to a mixture of water and maize. The system is installed between a pre-mixer and the liquid feeding tank. The pulses change the cell membranes of the crude fibres, an essential step to make these nutritional components digestible. The pig's gastrointestinal tract is affected positively. In addition, the cell disruption of the feed energy components ensures successful finishing of healthier pigs and reduces costs. An extensive study at the teaching and testing centre of the Chamber of Agriculture Schleswig-Holstein in Futterkamp has shown impressive results which prove these positive effects. Initially, the system was tested with maize plants. However, it seems that it can be applied to other feedstuffs as well. The food industry is already using PEF processing to treat fruit juices and products made from potatoes successfully and without using chemicals. The high-voltage pulses break the closed cell structures of enzymes in a way that the food is easier on the gastrointestinal tract, an advantage that is also beneficial to animals. The increased crude fibre share affects the pigs’ health positively, therefore making it possible to reduce the use of medication. Another positive effect: the available agricultural areas can be used more efficiently as the entire maize plant serves as nutrient, instead of only the cob. 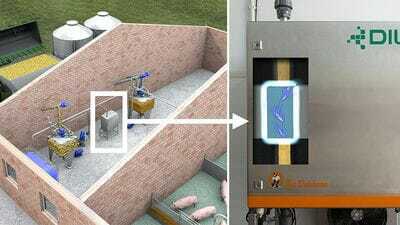 The PEF system makes the entire maize plant digestible for pigs. A pulsed electric field renders the indigestible vegetable into a healthy feed rich in crude fibre. The system is installed between a pre-mixer and the liquid feeding tank.